Use the Perimeter Annotation Options button, which is available in all profile, projected section, and cross section diagram menus, to access the settings which control how the diagram annotation will look. Intended Vertical Exaggeration Factor: Enter the vertical exaggeration to be used for this diagram. This setting can help assure appropriately-placed perimeter annotations, below. A setting of "1" means the horizontal (distance) and vertical (elevation) axes will be plotted at the same scale. A setting of "5" means that the vertical axis will be stretched by a factor of 5.
! Note that you can always change the vertical exaggeration at which the image is displayed, in the RockPlot2D window itself. But, by telling the program up-front how stretched the profile will be, you'll get better placement of the diagram annotations. 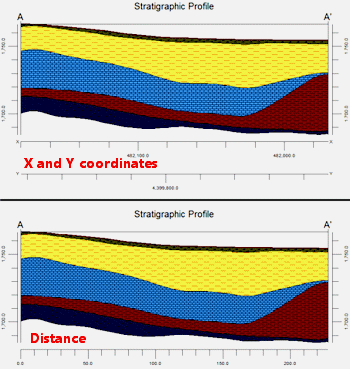 If we attempt to vertically exaggerate (by 10x) this diagram within RockPlot2D, the profile title will be too high, the coordinate axes will be too low, and the tick-marks within the coordinate axes will be stretched, as shown by the following example. This dilemma is solved by the "Intended Vertical Exaggeration Factor", which automatically adjusts the positions and dimensions of the offending entities (i.e. the title, the endpoint labels, and the coordinate axes) based on the user defined exaggeration factor. In the following example, we have selected an "Intended Vertical Exaggeration Factor" of 10.0 and plotted the diagram within RockPlot2D at a vertical exaggeration of 10.0. Title: Click in the prompt to type in the text to be displayed for the title. While you can manually edit the content of the title in RockPlot2D, it's usually easier to declare the title text here. Font size: Type in the size for the font, as a percent of the size of your project. Font Size, specified as a percent of project size. Left Label, Right Label: Click in these prompts to enter the text to be plotted for the left-edge label and the right-edge label. Font size: Declared as a percent of project size. Decimal Places: Type in the number of decimal places to appear in the labels. Tick Marks at Panel Edges: Check this box to include small tick-marks that extend upward at the panel junctions (sections) or at the diagram edges (profiles). They are typically used if you request the Plot Vertex Coordinates option. Size: The size of the ticks is declared as a percent of the project size. Default = 0.5. If you are plotting your section/profile at a vertical exaggeration significantly greater than "1", you might want to reduce the size of these ticks; if the Intended Vertical Exaggeration Factor (discussed above) is set to a value not equal to "1", this will be adjusted automatically by the program. Horizontal Line Along Top: Check this box to include a solid, horizontal line at the top of the profile or section. Vertical Lines at Panel Edges: Insert a check here to include vertical lines at the panel junctions (sections) or at the diagram edges (profiles). 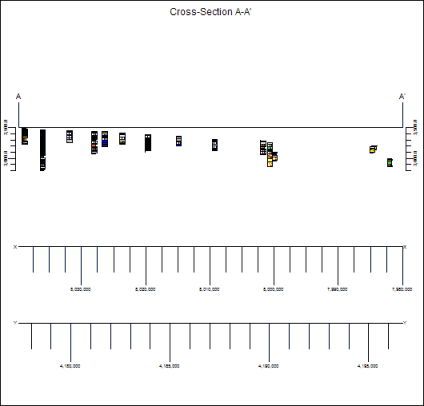 Vertical Axes Annotation: Check this box to include vertical axes with elevation labels. Tick Marks: Enter the size for the tick marks on the elevation (vertical) axes, as a percent of the project size. Default = 1.0. Labels: In this prompt type in the size for the elevation labels, as a percent of the project size. Automatic: The program will determine the intervals based on the vertical extent of the diagram. Manual: Enter the elevation units at which the tick marks and the labels are to be plotted. Decimal Places: Determines the number of decimal places to be displayed in the elevation labels. Automatic: Choose this option for the program to determine the number of decimal places automatically. Manual: Choose this option to specify how many decimal places you want in the labels. Label Angle: Choose Parallel to Axis for vertical labels, Perpendicular to Axis for horizontal labels. Caption: Enter here any label for the vertical axis (e.g. "Elevation"). Caption Angle: Choose Parallel or Perpendicular by clicking in the appropriate radio button. Font Size: This is specified as a percent of project size. Horizontal Reference Lines: Insert a check here to plot horizontal lines across the middle of the diagram. Automatic: The program will determine the intervals based on the vertical extent of the diagram. They'll match the Automatic label intervals of the vertical axis, above. Manual: Enter the elevation units at which the horizontal lines are to be plotted. 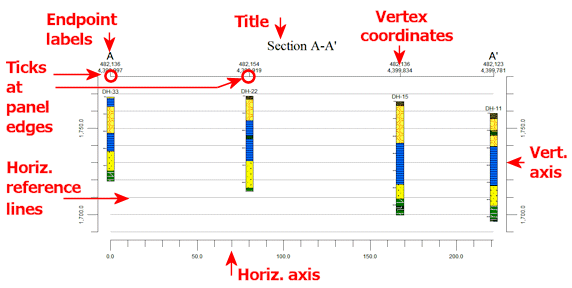 Horizontal Axis Annotation: Insert a check here to include the horizontal border axis in the plot. Tick Marks: Enter the size for the tick marks on the distance (horizontal) axis, as a percent of the project size. Default = 1.0. Labels: In this prompt type in the size for the distance or coordinate labels, as a percent of the project size. Horizontal (X) Intervals: The increments at which the ticks and labels appear can be determined either automatically by the program or defined manually by you. Automatic: The program will determine the intervals based on the length of the diagram. Manual: Enter the distance (section) or coordinate (profile) units at which the tick marks and the labels are to be plotted. Decimal Places: Determines the number of decimal places to be displayed in the coordinate or distance labels. Label Angle: Choose Parallel to Axis forhorizontal labels, Perpendicular to Axis for vertical labels. Single Axis (X = Distance from Start): Choose this option if the horizontal axis labels should represent distance along the profile from left to right. This is shown at the top of the following diagram. Dual Axis (X and Y Coordinates): Choose this option to display the actual X and Y coordinates along the profile. This is shown at the bottom of the previous diagram. Note that for cross-section diagrams, the horizontal axis always represents distance. Caption: Enter here any label for the horizontal axis (e.g. "Distance"). Elevation Range: Use these settings to select how the range of the vertical axis will be defined. Automatic: Choose this option to have the program set the perimeter annotation based on the elevation range of the diagram itself. This can be very useful if you've elected to hang a stratigraphic section on a particular formation (resetting all elevations relative to it) or if your diagram represents a subset of the larger project range. See the example on the right in the previous diagram. Manual: Choose this option to enter specific top and base elevation values for the diagram. This is handy if you don't want to default to the project dimensions but also want all of your diagrams to be labeled using the same elevation range. Minimum Elevation: Enter the elevation to be represented at the base of the vertical axes. Maximum Elevation: Enter the elevation to be represented at the top of the vertical axes.